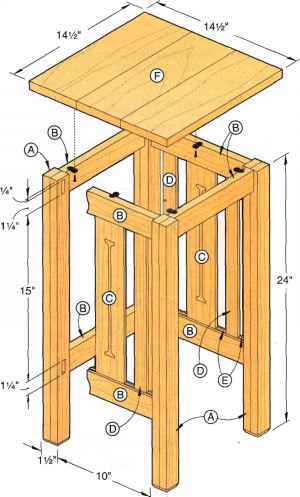 3 Lay out the mortises on the legs, referring to Drawing 1 on page 31 and Drawing 5a on page 34. Stand the legs for each table in assembly order to verify the mortise layouts. 4 Form the leg mortises. To do this, refer to steps 2-4 on Drawing 3, at right. For accuracy, drill the holes with a drill press, setting a fence to center the bit on the leg. 5 Rout or sand W chamfers at the bottom of each leg where shown. ICut the rails (B) to size for each table. At the same time, cut two or three scrapwood test rails (small-table size would be fine). Mark mortise location on leg. Drill %" holes 1" deep at both ends of mortise. Drill overlapping 5/ie" holes 1" deep between holes drilled in Step 2. 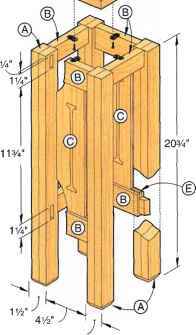 Finish mortise with a chisel, cutting sides and ends square. Bore recesses for the tabletop connectors with a y-ie" spade bit. The bit's point simultaneously drills a screw pilot hole. Parallel fences help you rout an arrow-straight slot between two holes for the cut-out design in the wide slat. Scrollsaw the ends of the decorative cutout. A #4 blade (.035 x.015", with 18 teeth per inch) is a good choice. give them the shape shown in the drawing. 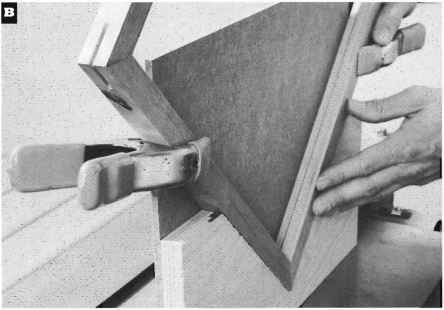 To cut the tenons, install a -A" dado blade on your tablesaw. Position the tablesaw's rip fence 3/i6" from the dado blade, as shown on Drawing 4. 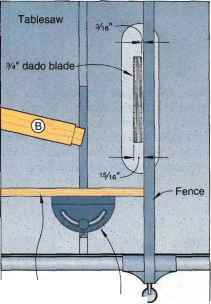 Attach an auxiliary fence to the saw's miter gauge, extending it to the rip fence, as shown on the drawing. Set the cutting depth to 3/i6", and cut both faces at one end of a test rail, holding the end against the rip fence. Make another pass with the end pulled back far enough to cut the end of the tenon. Insert a corner of the tenon into a mortise to check its fit. Adjust the cutting depth as necessary. When correct, cut both faces at both ends of all 21 rails. Next, set the cutting depth at lA". Stand the test rail on one edge, and cut the tenon. Ensure that this distance from the rail edge to the tenon will place the rail's top edge flush with the leg top. Adjust if needed. Then cut one edge of each rail end. Finally, set the cutting depth at Vi. Saw the other edge of the test rail's tenon. Test-fit the pieces and adjust as before, and then cut the remaining rail edges. 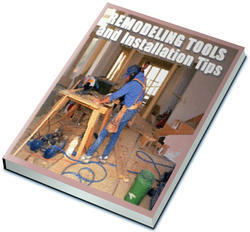 After making the last cuts, leave the tablesaw cutting depth set where it is for the next step. 3 Change to a 'A" dado blade, and saw a centered groove [A" deep, where shown on four of the seven rails for each table. The slats (C, D) and spacers (E) will slide into these, so verify the width of the groove against the thickness of the stock for those parts. 4 Miter-cut the tenon ends to 45°. Those at the front of the bottom side rails don't require mitered ends. But cutting all of them makes the side rails interchangeable, heading off a complication come assembly time. 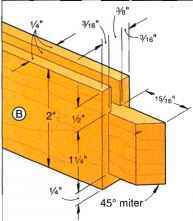 ICut the wide slats (C), narrow slats (D), and spacers (E) to size from '/"-thick stock. Note that the small table doesn't call for any narrow slats. 2 Make 12 photocopies of Drawing 6, the Decorative Cutout Full-Size Pattern on page 35. Adhere two copies to each part C, placing the top of each pattern at one end of the part. Spray adhesive (follow the label instructions for temporary bonding) or rubber cement will hold them in place. 3 Drill 3/s" start holes in each wide slat (C), where shown. 4 Rout the straight center portion of the cut-out design. To do this, install a 'A" straight bit in your table-mounted router. Position a fence to center the bit on the wide slat. Clamp another fence along the other edge of the part, as shown in Photo A, left. Then, with the cutting depth set to about 3/s", place the hole at the left end of the part over the bit, start the router, and cut the decorative slot between the two holes. 5Scrollsaw the ends of the decorative cutout, as shown in Photo B. Sand the routed and sawn edges, as needed. Remove the patterns. 1 Dry-assemble (without gluing) the legs, rails, and slats for the right leg assembly, referring to Drawing 5 (large table). You can leave out the spacers (E) for this test-fitting. Check for joint fit and squareness, and ensure that the top of the rail lies flush with the leg tops. Unclamp the parts, and disassemble. 2 Glue together the rails and slats for the assembly. To do so, start by placing the center slat exactly in the middle of one rail. 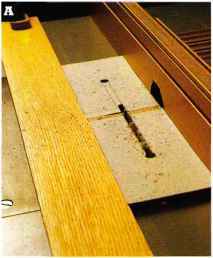 Put a dab of glue in the groove on each side of the slat, and slip a spacer into the groove against each edge of the slat. Center the other rail on the other end of the slat, and glue in the spacers. Slide in the first narrow slat, and fix it in place with spacers. Continue until all slats and spacers are in place. 3 After the glue dries, glue the front and back legs to the assembled rails and slats. 4 Put together the left leg assembly in the same way. Build the left and right leg assemblies for the other tables. 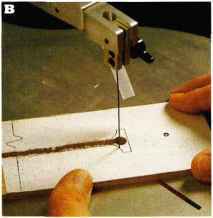 The leg assemblies for the other tables differ from the drawing only in the number of narrow slats (D). The medium table has two narrow slats per assembly; the small table, none. 5 Connect the leg assemblies for each table base with the remaining rails, referring to Drawing 1. 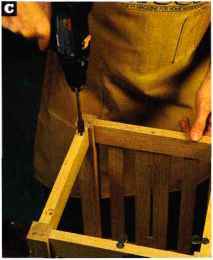 To ensure wob-ble-free tables, assemble them on a known flat surface, such as your table-saw's table.